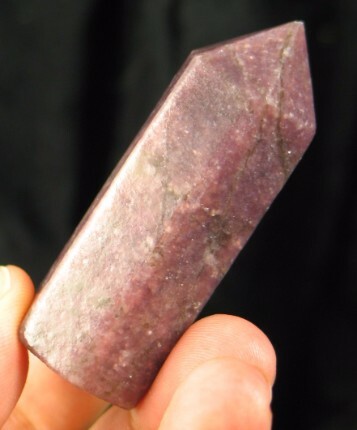 This polished point of lepidolite sparkles as you move it in the light. 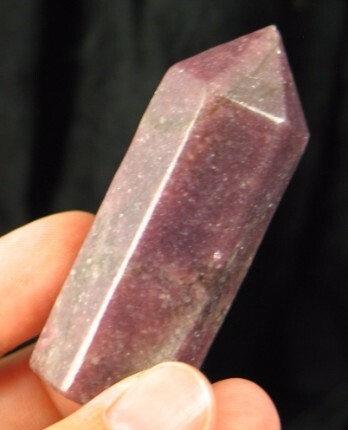 A crystal with six evenly spaced sides and six approximately equal faces that center at the tip is called a generator point. It is believed that they have the ability to store, amplify and transmit or generate energy. They are used to facilitate a connection or create unity between the members of a group and transmit thoughts in a manner similar to a high power radio transmitter and antenna. Lepidolite is the beautiful purple or lavender mica that takes its color from traces of lithium. It forms in tabular hexagonal crystals that stack like a deck of cards. 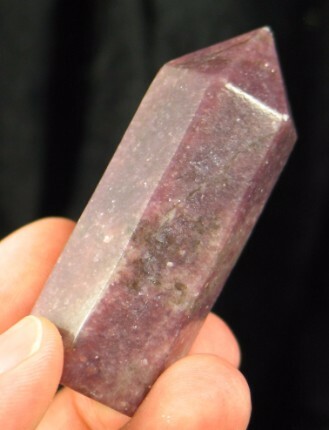 Because of its relative softness, lepidolite is sometimes given a clear coat to strengthen the piece when polished into points. It has energy that soothes frayed nerves and relieves stress. It helps one find a way to deal with emergencies life throws at you. It helps you not second guess your decisions, and helps you put behind all the what-ifs. Relax and enjoy what life has to offer. 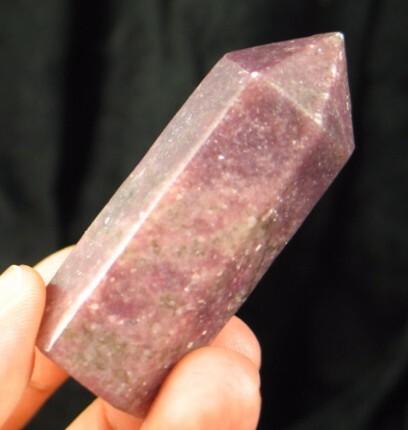 Lepidolite activates the throat, heart, and third-eye chakras. It is an excellent mineral for alleviating stress, including stress related ailments such as digestion and tension. 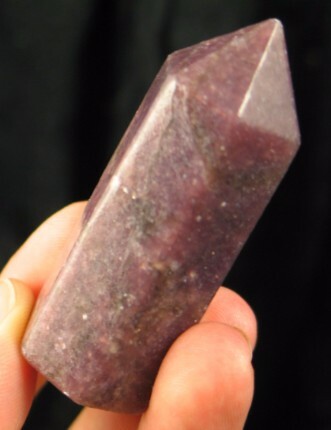 Lepidolite also facilitates opening one to honest and fairness, both to oneself and others. It induces and enhances self-love and acceptance. Lepidolite also enhances communications, making it an asset for businesses where diplomacy and unimpeded communications are necessary.